Our internal Business Partners don’t have a tool to budget their AMEX Advertising dollars effectively. compare the constructed, and if needed, optimized scenarios. Through our research, we discovered users want to compare different budget scenarios, and determine, through data visualizations, the differences between each. For a deeper understanding of their allocations, users wanted to modulate each channel and product that make up each channel. The Walk Through Wizard guides users through the process of entering parameters for the budget projection. Users import data, set dates, and can manipulate each allocation per channel and by product. A user can build separate scenarios and compare. They will also be able to optimize a selected budget utilizing the tools business intelligence and access to big data, to build the most optimal allocated funds. A user can then understand through the data visualizations, how each individual plan is broken down and how they compare to one another. Through testing with our users, we learned that they wanted to import one budget and keep it as a template to build a second budget. Therefore, we built functionality to allow a user to base a new budget off an existing imported budget by duplicating it. Users needed a much more concise but efficient Walk Through Wizard to start the process. Through our discussion, we learned that because they only use the application once every 6-12 months, many users needed more structured guidance and hand holding. Understanding the usage contexts of the application helped me develop a clear vision of the interactive expectations of the users. We developed a set of experience principles woven through the application. These were used to support design decisions, articulate core values and describe key attributes the application experience should embody for the users. The principles were used consistently to drive the aesthetic feel and overall direction of the application. Users want to be able to allocate, down to the product line, in order to fine tune their allocations to see effectiveness. 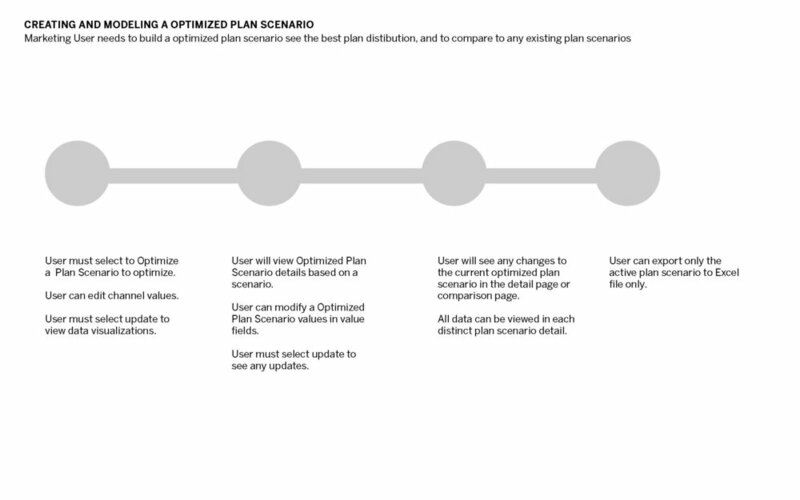 They like to see the data visualizations comparing plans and the optimization features to help them finish their planning by offering the “best” plan.